Après-ski has become a very important part to most people's catered chalet holiday and a good resort should always include a fair selection of bars offering this end-of-ski-day/ last-run indulgence. So what is it? Well the phrase translates literally into 'after ski' and it is the term given to the activity of coming straight from the mountain around 4.30-5pm and into a bar for a drink - quite often there will be a live band or musician and what ensues is a late afternoon/early evening boogie! Meribel is famous for its après ski. But fear not, you need not have skied all day to enjoy this particular treat - anyone can join in - the more the merrier. There are some seasonnaires who will get kitted up in their skiing gear and either just do one run or go up on the bus to whichever bar so they look the part! Believe me - there is no need to go to such lengths to take part! 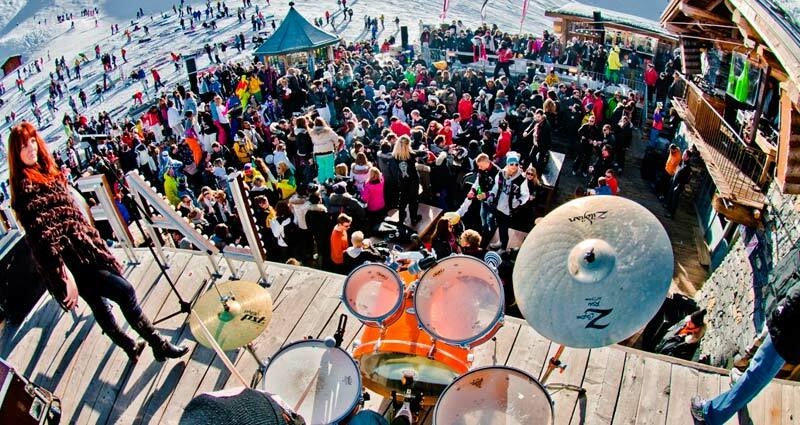 At the end of the day there is always at least three bars on the piste or around Meribel that will be playing live music - there is something for everyone from one man acoustic sets, to live DJ's, to cover bands. You can find out the programs by clicking on the links below. Or in resort, the local radio station R Meribel, will broadcast a what's on guide including the most up to the minute low down on all live music both après and later in the evening. The most famous place in Meribel is the Rond Point, or Ronnie's, sitting on the Saulire side of the valley where several runs meet, this place has been doing après since the early 90's. It's success? well it catches the afternoon sun on their huge heated terrace as well as all the skiers and boarders on their last run. It's a compulsory part of your Meribel experience, along with the toffee vodka they serve. Lodge du Village (LDV) is in Meribel Village at the bottom of the lovely blue Lapin piste. There's a Happy Hour every day from 4pm until 6pm with all your favourite drinks from Toffee Vodka to a lovely warming piping hot Vin Chaud. The legendary Tuesday evening Après Ski with Bring Your Sisters, Yard of Ales and horn playing from Tim will continue throughout Winter 2014! In Meribel town, in the complex of shops and bars right by La Chaudanne you will find Jacks Bar. There's always something going on at Jacks, from live comedy acts, games such as toss the boss and Monday - Friday 5-7 plenty of après action. New last season was the La Folie Douce (Sweet Madness). Strictly speaking, they operate a little before 'après' time closing at 4.30pm. More of a late lunch and party kind of place with DJ's, dancing girls and boys and liberal champagne spraying. Last season it opened to mixed reviews - what had kind-of happened more organically in Val Thorens and Val d'Isere with this brand was brought into Meribel - and you just couldn't help feeling it was a little forced, but after a winter?